Last Saturday was a memorable date in the history of the Dublin Theatre Royal, and will be long an epoch in the local fortunes of the Drama. On that night the final performance under the proprietorship of Mr John Harris took place, and when next the curtain rises on the stage at Hawkins Street it will be at the bidding of the Messrs Gunn the new owners. An event of such importance cannot be dismissed with the mere record of its occurrence. We cannot allow the late lessor to retire from the place he has so long filled without some form of valediction. Mr Harris retired from the anxieties and triumphs of well nigh a quarter of a century with a reputation seldom earned by any man whose line of life was the same as his. It is the conclusive test of his endeavours that, having found the Theatre Royal a decaying establishment; he made it the splendid property it is. There needs no eulogy upon his personal character more that this---that he carries with him into retirement a regard in which the popular feeling and the sentiment of the profession are enthusiastically blended. The method of Mr Harriss success was no less honourable than its completeness. Setting out with the sound principle that What is best pays best, he spared no exertion and grudged no sacrifice to give the maxim practical operation. An unexcelled business capacity, great shrewdness of perception regarding the prevailing vogue, aided by a daring well-balanced spirit of enterprise and unvarying liberality and uprightness in all his dealings were the weapons with which Mr Harris vanquished enormous difficulties, and worked his steady way to well-deserved prosperity. Mr Harris performed a notable public service in that he rescued the Dublin stage from the degradation and squalor into which it had fallen when he ventured to take upon his shoulders the immense and perishing interests of the Theatre Royal. It was an undertaking, which only a consummate self-reliance united with special ability of the highest kind, could have justified him in attempting. The story of his predecessors was for the most part a dismal chronicle of struggle and failure. And here, we are of opinion, it is appropriate to the subject and occasion to notice shortly the progress of the stage in Dublin, with particular reference to the Theatre Royal and its vicissitudes. Every reader of Gilberts History knows that the first theatre erected in Dublin was in Werburgh Street, in 1684, by John Ogilby. Shakespeare was dead nigh 20 years when the first temple was opened to Thespis upon Irish Ground. Two centuries and a half ago the times were not favourable to public representations. The theatre was closed by order of the Lords Justices. 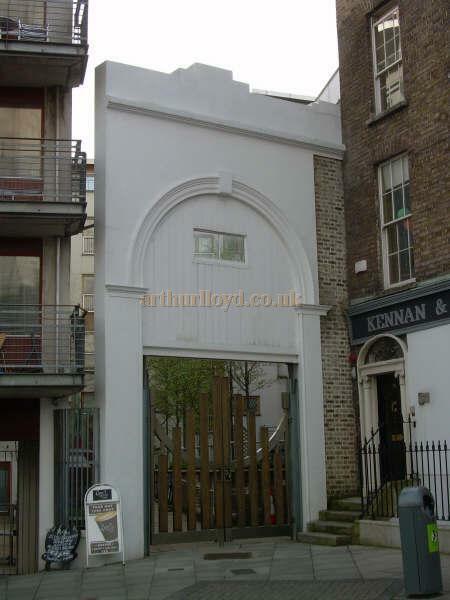 Nearly thirty years afterwards the same Ogilby opened a second house in Smock Alley, now Essex Street, where in the beginning of the last century a clever company entertained the lieges. Right - A drawing of the Theatre Royal, Smock Alley, Dublin - Courtesy Des Kerins. In 1732 Madame Violante opened a sort of theatre in Fownes Court. In this establishment Peg Woffington fair, frail and a charming actress made her debut. 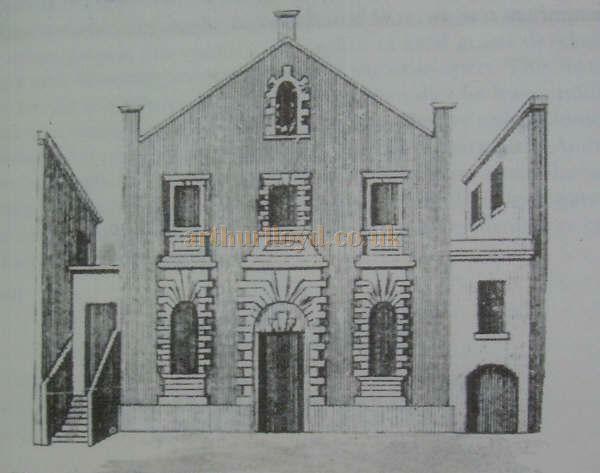 Smock Alley quarrelled with Madame Violante and the result was the opening of a third theatre in Rainsford Street. In May 1733 the first stone of a new theatre was laid at the juncture of Longford and Aungier Streets, and the March following, the house thus expeditiously prepared was opened. This rivalry stimulated the Smock Alley people. They pulled down the old edifice, and in seven months were playing in a brand new building. These were balmy days with Dublin playgoers. Three theatres were in full swing; actors, as well graced as ever portrayed the age, drew thronged audiences. Quin the conqueror of Booth, Spranger Barry Garricks nearest rival, Giffard, the great David himself and The Woffington, touched with their various arts the public mood. In 1766 Thomas Sheridan concluded a harassing connection with the Smock Alley Theatre and two years after, the Crow Street Theatre was opened with Spranger Barry as manager. He maintained a fierce competition with Messop, manager of Smock Alley, who played a trump card in the engagement of the capable actor, Macklin and, after a seven year struggle, beat Barry out of the field and became possessed of both theatres. It was a Pyrrhic victory for, before five years had elapsed, Mossop totally ruined, gave up both theatres. The History of the Theatre Royal a valuable and interesting book published by Ponsonby of Grafton Street presents us at this point with a melancholy succession of managers entering on sanguine possession and retiring more or less beggared by their perilous speculations. Dawson, Ryder, Daly, Crawford and Jones--all men of energy and tact-- tried to wrestle with the evil fortune, which seized the theatres of Dublin. Each after each they came to grief, their mishaps however being unequal in degree. Ryder became a broken bankrupt; Crawford whose adversities were not without features of grotesque pathos, fell into the grasp of the sheriffs, and in 1790 Smock Alley ceased to exist as a theatre. Daly, after the expenditure of large sums, was obliged to part with the Fishamble Street Music Hall, which was converted into a private theatre, under the management of Lord Westmeath and Frederick Jones. In 1798 Jones took over the Crow Street theatre from Daly on exceedingly onerous terms. Jones management was marked by an episode of note. In 1814 a piece called The Forest of Bondy founded on the well-known story of the dog of Montargis was to be produced on a command-night. The proprietor of the trained Newfoundland who represented the famous canine of the tale, taking advantage of the crisis, struck for an advance of salary for his animal. Jones was stubborn in his refusal and the dogs owner was as obstinate. The manager attempted to substitute The Miller and his Men but the disappointed audience insisted on the piece announced. Jones, a proud and surly person, would neither apologise nor explain, and so the public demolished the theatre and were with some difficulty persuaded from setting fire to the shell of the building. Five years after, a controversy between the unlucky Jones and a female singer provoked a second riot, still more disastrous to the management of the theatre than the first. Poor Jones, who was thrown into prison for debt, having had to part his interest in Crow Street to Mr Henry Harris of Covent Garden Theatre, the new patentees decided to open the house on another site. Crow Street was closed from that day, it fell to wreck, and a medical school now stands on the spot. Smock Alley had been replaced by a Catholic church. The Molyneux Asylum is built on the site of Astleys Circus. Mr Henry Harris, having decided on some other site, chose Hawkins Street. Here on the 14th October 1820 the first stone of the present Theatre Royal was laid, on ground, which had previously been successively occupied by a meat market, by the Royal Dublin Society and by the Mendicity Asylum. Mr Beasley was the architect; the estimated cost of the new theatre was £50,000, part of which the patentee raised by the issue of fifty debentures of £50 each. From five to seven hundreds persons were employed in the work, which was pushed on with such celerity as to be completed in a couple of months. Portion of the premises of the Dublin Society, the front facing Hawkins Street, was let stand; the portion newly built measured an extreme of 100 by 108 feet, the walls being 78 feet high and the span of the roof 78 feet. Other dimensions of the theatre are  from curtain to front of centre box, 52 feet 6 inches; across the pit, 45 feet; the stage from the foot lights to the back, 60 feet; breadth of the stage from wall to wall, 73 feet. for comparison sake let it be stated that Drury lane measures from curtain to front of centre box 61 feet; across the pit 50 feet. the stage at Hawkins Street suffers little by contrast with the largest. It is spacious enough for all purposes of theatrical representation. The new theatre was opened on the 18th January 1821, when the acting manager, Mr Percy Farren delivered an address by George Coleman the younger. The programme for the night included The Comedy of Errors and The Sleep Walker each piece sustained by the manners of a numerous and powerful company. From this night down to our day the record of the Theatre Royal, marked with frequent vicissitudes is for all that, a brilliant one. The great actors of the intervening time have made their bow to audiences within its walls; the most notable histrionic triumphs witnessed in Ireland have been achieved upon its boards. Fortune has played such antics with management as are unknown elsewhere in the country. This house commenced its career with an éclat unequalled by the Irish Theatre before or since. A few months after its opening George IV, then on a visit to Ireland, was present at the performances. The treasury netted £600 that night. It would be Tedious as a twice-told tale though not without a certain interest to recapitulate the long roll of those who have succeeded as aspirants to fame and favour on the stage of this house. We can only enumerate the mere eminent. In Nov 1822 the celebrated Liston appeared. In Dec of the same year the religio-political disturbance known as the Bottle Riot occurred, when an attack with missiles was made by certain of the audience upon the Viceroy, The Marquis of Wellesley, who was obnoxious to the Orangemen. In October 1823 gas was used in the theatre and next year Macready appeared for the first time in Hawkins Street as Virginius. The season of 1824-5 was marked by the first appearance of John William Calcraft. Abbott making his debut in Dublin that same night. Braham, Madame Vestris, Wallack, Miss Stephens and Mrs Paton appeared in this era. In 1825 the fashionables of Dublin agreed to devote Saturday night to the theatre. The compact has lost its force, but its tradition is still visible in the calibre of Saturday night audiences. It is a fact worthy of particular note that in 1826 Mr Levey, the present popular musical director of the theatre, at the time a mere boy organised the band. In 1827 Edmund Kean and T P Cooke appeared. The first Italian Opera Company appeared this year in Hawkins Street. The singers who composed it are now forgotten names. The following year Charles Kean made his first appearance in Dublin, and achieved but a doubtful success. Before this the financial condition of the establishment had grown so bad that Mr Harris let it to Mr Bunn at £3,000 a year. Bunn succeeded no better than Harris and Ducrow took the theatre for his equestrian exhibition. It was now given in hand to George Robins to be sold. But the poet of auctioneers failed to dispose of it. In 1830 Mr Calcraft became lessee of the theatre for seven years at a rent of £2,000 a year, and £50 per annum for a house in the arcade. During the period for which he held it, extending over sixteen years, Mr Calcraft hardly gained a shilling profit. He has been truly described as too much the servant of the public. Drama and opera, with gorgeous pantomime and occasional fancy balls, the pit being boarded over for the company, eked out the term of Mr Calcrafts energetic and intelligent lesseeship. The notable appearances during his occupation of the theatre were those of Charles Mathews, Ole Bull, the American Rice, the first Ethiopian Serenader, Brooke, Tyrone Power, Buckstone, Farren, Helen Faucit, Balfe, Garcia, Grisi, Mario, Lablache, Sheridan Knowles, Thalberg, Taglioni and Sims Reeves. But these illustrious names did not better the state of the manager. Neither the unparalleled combinations in opera nor the singing of Jenny Lind, when the pit was thronged at 12s 6d a seat, and the upper galleries choked at 5s, could arrest the end, which came in 1851, when Mr John Harris, for some three years previously proprietor of the Adelphi [now the Queens], in Brunswick Street, took the Theatre Royal. Mr Harris opened his new house on Boxing Night 1851. He found the theatre under ejectment for non-payment of rent, amounting to £1,200,which he was obliged to pay at once. It was otherwise in a wretched state. He laid out £3,000 in putting it right. The company on the opening night included Messrs C W Granby, J Webster, F Robson, T C King, Bellair, Vivash, Mrs Parker, Miss Kate Dibden, Miss Jenny Marston and Miss Raymond. Mr Granby joined the company on the 8th January 1851, his first appearance being as Mr Hardcastle. Mr Harriss management was marked from the very first by that spirit of judicious enterprise which has been the secret of his success. He produced a brilliant series of piecesgrave and gayin exquisite style, and before the first year of his connexion had expired set upon the stage a succession of Shakespearian Revivals on a scale of boldness, originality and finish never before attempted and not since excelled. Macbeth was the first presentation, and in this play the chorus of witches numbered no less than thirty-six minor members of the company. Among the other items of the Revival were The Merry Wives of Windsor, The Winters Tale, A Midsummers Night Dream. Of these the authority from which we take our facts observes, More delightful performances, or more perfect in every detail, have never been witnessed in any theatre. It is no wonder then, that the end of the year should have brought the spirited proprietor a flattering tribute in the shape of a personal communication from the Lord Lieutenant acknowledging the excellent character of the entertainments. Mr Harris passed from success to success. The fortune which had fled from and mocked his predecessors seemed overcome by this new assailant. Crowded houses attended season after season the performance of plays and operas produced in a manner unknown before. The catalogue of those who appeared on the boards of the Theatre Royal since it passed into Mr Harriss hands exhausts every great professional name of our generation. Besides the admirable actors of the original stock company, some of whom, as Mr Granby, still charm their audiences, the talent of the entire histrionic and lyric arena displayed itself in this house of honoured associations. The sweetest accents of their age, the aptest graces of representation, have wrought subtle spells within walls which have echoed the music of a Patti, a Tietjens or witnessed the fervours of Ristori and Bateman or of Kean and Sullivan. In 1857 a project of erecting another theatre in Dublin was defeated, and more recently legislation concerning the question of debentures harassed the proprietor. The end of Mr Harriss connection with the Theatre Royal was marked by the same exertion and largeness of spirit which marked its commencement. To the last the stamp of the man was upon the business of his hand. Now he has retired from the sphere of his labour, the public will better perceive their indebtedness for all that he has done towards their amusement and cultivation. He has developed the aesthetic in his supporters by the manner of entertainment he provided; and, never looking to the sensational for success, he has the proud consciousness that nothing he has gained was got by sacrifice of the smallest propriety. For those professionally concerned with him may well congratulate themselves when they shall have to do with his like again. If this is a fit time to speed the parting manager with due praise, it is also the suitable moment in which to welcome the new proprietors. The gentlemen who have succeeded Mr Harris will, we have no doubt, prove themselves worthy to fill the place he has vacated. We have a right to expect that the administration which has made the Gaiety in the brief period of its existence one of the most elegant and successful establishments in these kingdom swill not fail to maintain the prosperity of the Royal. 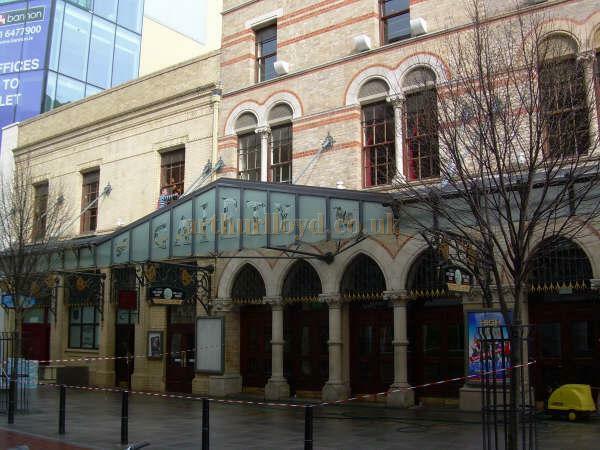 Right - The Gaiety Theatre, Dublin in March 2009 - Courtesy Des Kerins. The Messrs Gunn have given practical guarantees of their capability in this respect. The enterprise and liberality with which the Messrs Gunn have conducted the Gaiety since its opening have been their friends, as these characteristics have befriended the house with which until Saturday they sustained a fair and honourable rivalry. Since the Theatre Royal has passed from the possession of Mr Harris we are content with the change which has it to the Messrs Gunn. We confidently hope that the entertainments henceforth to be presented in two houses under one regime will be as distinct and as excellent as before; that the stately Royal and the beautiful Gaiety will preserve the better specialities which kept their respective performances so pleasingly diverse. 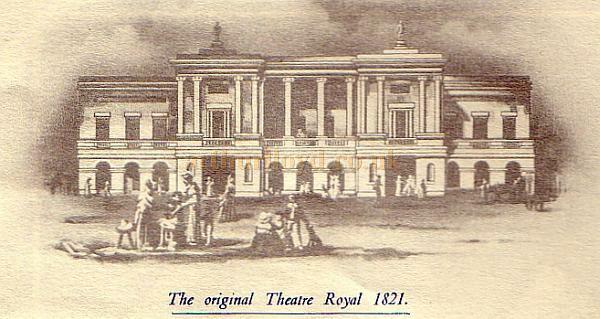 We look forward, moreover, to find that the Theatre Royal will continue to possess the high reputation for decorous representation and unexceptional propriety which were its distinguishing characteristics during Mr Harriss lesseeship, and in a great degree begot the respect and esteem which now attend him into his retirement. The text on this page was very kindly transcribed for the site from a report in Dublin's 'Freeman's Journal' of the 3rd of March 1874, by Des Kerins.